This is to make you notice with the Adobe Off Campus 2018 Drive For Freshers. This is very good news for all the students who are in the final year of their graduation and also for the graduates of the year 2017. We wish that you will make use of this opportunity and get a job in the Adobe company. To help you in the off campus drive, we are here providing you with all the details that are required to attend the interview drive of Adobe. We suggest the students check complete details of the Adobe off campus such as eligibility criteria, salary and selection process before applying for the drive. Being a fresher you will be having a thought to get placed in any one of the MNC companies. This is the best chance for you to make your dream come true. 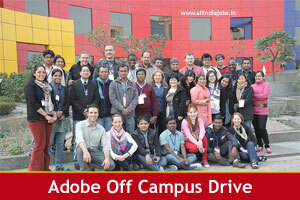 In this article, we are providing you with all the details, eligibility criteria and also some of the Adobe Interview questions that will be useful for you to attend the Adobe Off Campus 2018 Drive For Freshers. As you might not have an idea about the interview process, it is suggested for you to refer Adobe placement papers so that you can get an idea about the interview process and Adobe test pattern. There will be prescribed eligibility criteria for each and every company based on their company norms. Candidates who are graduated in BE / B.Tech / ME / M.Tech, M.Sc in Computer Science / Information Technology MCA with B.Sc / B.Com / BCA / BA (with Math / Statistics / Computers Background) in the year of 2017 and who are presently in their final year of graduation are eligible to apply for Adobe Off Campus 2018 Drive For Freshers. For, Adobe it is mandatory that a student should have at least minimum of 70 percent of aggregate or 7 CGPA. The candidate should also be a graduate or a post graduate from a recognized university/ college. The candidates possessing good technical and logical reasoning skills are generally preferred by the recruiters of Adobe. Candidates having additional certifications and knowledge with C/ C++ and algorithms are given importance when compared to the other candidates. Knowledge of microprocessor programming and automata theory can be an added benefit. The interview process at the Adobe is a quite long one. It comprises of the following rounds. It will be having some general aptitude, reasoning questions. This technical round will mainly contain the technical questions from the C Language, Automata Theory and Micro Processors. They will also check you for some other technical knowledge that is required by them. There will be an HR Interview Round in the ending, where you get clarified with the interviewer and also get familiar with the company norms. In this round, you will be asked some general questions regarding your interests. The candidates having a backlog in any of their semester examinations are not allowed for this interview. So, students are requested to make a note of this point before they attend for the Adobe Off Campus 2018 Drive For Freshers Recruitment Drive. The salary for the candidates who have got placed in the Adobe will be 8 (L.P.A). The salary may also be changed based on the positions you are recruited for. So, the candidates are required to check the official website for the present details regarding the salary. Click on the provided link for registration. Fill all the details that are asked in the form. Read HR Interview Questions and Answers. Check the details entered once again before clicking on the submit button. Make a note of the reference number and the password for further references. There will be some documents that are necessary to be [provided at the time of the interview. You may be in a hurry in getting prepared for the Adobe Off Campus 2018 Drive For Freshers interview. So to make it comfortable for the students we are here giving you the details of all the documents that are to be carried along with you while attending the interview. Updated resume of 3 copies. Marks Memos of the previous semesters. Also, if you have other special certifications you can mention them in your resume and carry the related certificates while attending the interview. You can get some of the important tips here to crack the interview at Adobe. Get updates about all the projects that the company is presently dealing with. Without any confusion clearly explain whatever you know related to the questions posed. Always try to answer in the simplest possible way. You can also check the HR Interview Questions Provided by us. Our website www.allindiajobs.in is a place where you can get all the details and notifications related to the latest job updates and also the previous placement papers and interview questions that will be useful for you at the time of preparation for the interview. For any further updates related to this recruitment drive or any other job updates, you can stay connected with our website.